An MRI typically costs more than a CT scan. One advantage of an MRI is that it does not use radiation while CAT scans do. This radiation is harmful if there is repeated exposure. The effective radiation dose from CT ranges from 2 to 10 mSv, which is about the same as the average person receives from background radiation in 3 to 5 years. Usually, CT is not recommended for pregnant women or children unless absolutely necessary. None. MRI machines do not emit ionizing radiation. 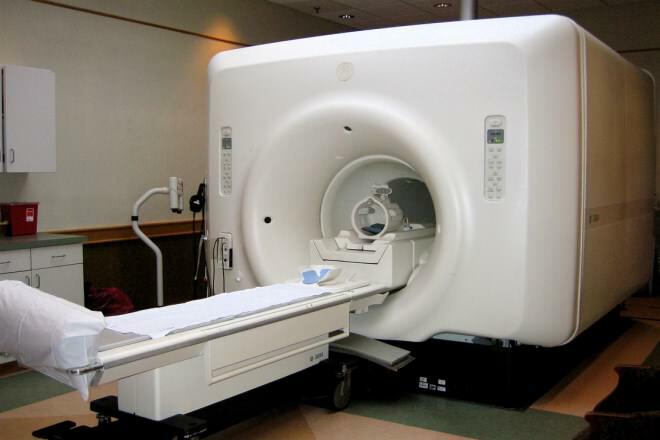 CT Scan costs range from $1,200 to $3,200; they usually cost less than MRIs (about half the price of MRI). MRI costs range from $1,200 to $4,000 (with contrast), which is usually more expensive than CT scans and X-rays, and most examining methods. Usually completed within 5 minutes. Actual scan time usually less than 30 seconds. Therefore, CT is less sensitive to patient movement than MRI. Depending on what the MRI is looking for, and where it is needing to look, the scan may be quick (finished in 10-15 minutes) or may take a long time (2 hours). Despite being small, CT can pose the risk of irradiation. Painless, noninvasive. No biological hazards have been reported with the use of MRI. However, some may be allergic to the contrast dye, which is also inappropriate for those suffering from kidney or liver disorders. Computed (Axial) Tomography Magnetic Resonance Imaging. Suited for bone injuries, Lung and Chest imaging, cancer detection. Widely used on Emergency Room patients. Suited for Soft tissue evaluation, e.g., ligament and tendon injury, spinal cord injury, brain tumors, etc. CT can outline bone inside the body very accurately. MRI is more versatile than the X-Ray and is used to examine a large variety of medical conditions. With capability of MDCT, isotropic imaging is possible. After helical scan with Multiplanar Reformation function, an operator can construct any plane. MRI machines can produce images in any plane. Plus, 3D isotropic imaging also can also produce Multiplanar Reformation. A major advantage of CT is that it is able to image bone, soft tissue and blood vessels all at the same time. Provides much more soft tissue detail than a CT scan. X-ray attenuation is detected by detector & DAS system, followed by math. model (back projection model) to calculate the value of pixelism that becomes a image. Body tissues that contain hydrogen atoms (e.g. in water) are made to emit a radio signal which are detected by the scanner. Search for "magnetic resonance" for physics details. The first commercially viable CT scanner was invented by Sir Godfrey Hounsfield in Hayes, United Kingdom. First patient's brain-scan was done on 1 October 1971. First commercial MRI was available in 1981, with significant increase in MRI resolution and choice of imaging sequences over time. Good soft tissue differentiation especially with intravenous contrast. Higher imaging resolution and less motion artifact due to fast imaging speed. Demonstrates subtle differences between different kinds of soft tissues. Non-ionic iodinated agents covalently bind the iodine and have fewer side effects. Allergic reaction is rare but more common than MRI contrast. Risk of contrast induced nephropathy (especially in renal insufficiency (GFR<60), diabetes & dehydration). Very rare allergic reaction. Risk of reaction in those who have or have a history of kidney or liver disorders. Seldom creates claustrophobia Anxiety, especially anxiety caused by claustrophobia, is common, as is tiredness or annoyance over having to stay still on a hard table for a long period of time. Patients with metal implants can get CT scan. A person who is very large (e.g. over 450 lb) may not fit into the opening of a conventional CT scanner or may be over the weight limit for the moving table. Patients with Cardiac Pacemakers, tattoos and metal implants are contraindicated due to possible injury to patient or image distortion (artifact). Patient over 350 lb may be over table's weight limit. Any ferromagnetic object may cause trauma/burn. 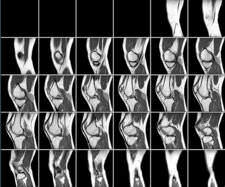 An MRI of the left knee. Using a very powerful magnet and pulsing radio waves, the detection coils in the MRI scanner read the energy produced by water molecules as they realign themselves after each RF alignment pulse. The collected data is reconstructed into a two-dimensional illustration through any axis of the body. Bones are virtually void of water and therefore do not generate any image data. This leaves a black area in the images. 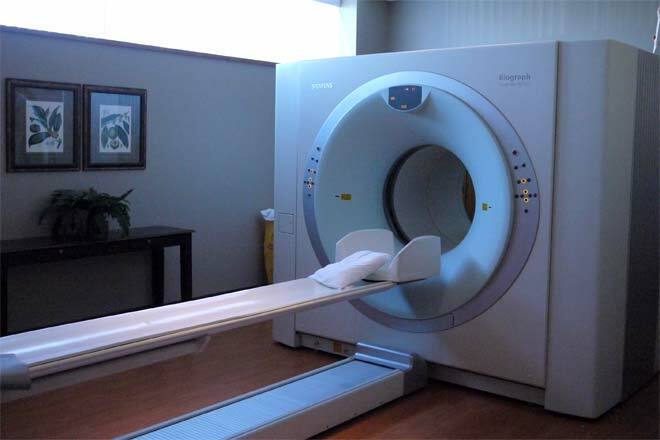 MRI scanners are best suited for imaging soft tissue. CT, Computerized Axial Tomography, uses x-rays to generate images of the body, including bone. In the CT scanner the x-ray tube, (source) rotates around the patient laying on the table. On the opposite side of the patient from the tube is the x-ray detector. This detector receives the beam that makes it through the patient. The beam is sampled via some 764 channels, (approximate number of channels). The signal received by each channel is digitized to a 16 bit value and sent to the reconstruction processor. Measurements are taken about 1000 times per second. Scan rotations are usually 1 to 2 seconds long. Each view/channel chunk of scan data is compared to calibration scan data of air, water and polyethylene (soft plastic), previously acquired in the exact same relative location. The comparisons allow the image pixels to have a known value for a particular substance in the body regardless of differences in patient size and exposure factors. The more samples or views, the better the picture. For more information, see this video, which further discusses different types of imaging scans, including the ultrasound, CT scan, MRI, and PET scan. A CAT scan uses X rays to build up a picture. MRI uses a magnetic field to do the same and has no known side effects related to radiation exposure. MRI gives higher detail in soft tissues. One of the greatest advantages of MRI is the ability to change the contrast of the images. Small changes in radio waves and magnetic fields can completely change the contrast of the image. Different contrast settings will highlight different types of tissue. Another advantage of MRI is the ability to change the imaging plane without moving the patient. Most MRI machines can produce images in any plane. Contrast agents are also used in MRI but they are not made of iodine. There are fewer documented cases of reactions to MRI contrast and it is considered to be safer than X-ray dyes. For purposes of tumor detection and identification, MRI is generally superior. However, CT usually is more widely available, faster, much less expensive, and may be less likely to require the person to be sedated or anesthetized. CT may be enhanced by use of contrast agents containing elements of a higher atomic number (iodine, barium) than the surrounding flesh. Contrast agents for MRI are those which have paramagnetic properties. One example is gadolinium. Iodine use may be associated with allergic reactions. 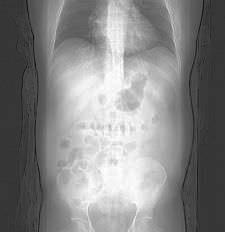 The radiation doses of CT scans (a series of X-ray images from multiple angles) are 100 to 1,000 times higher than conventional X-rays. A single CT scan exposes a patient to the amount of radiation that epidemiologic evidence shows can be cancer-causing. The risks have been demonstrated directly in two large clinical studies in Britain and Australia. In the British study, children exposed to multiple CT scans were found to be three times more likely to develop leukemia and brain cancer. In a 2011 report sponsored by Susan G. Komen, the Institute of Medicine concluded that radiation from medical imaging, and hormone therapy, the use of which has substantially declined in the last decade, were the leading environmental causes of breast cancer, and advised that women reduce their exposure to unnecessary CT scans. CT is very good for imaging bone structures. Some patients who have received certain types of surgical clips, metallic fragments, cardiac monitors or pacemakers cannot receive an MRI. The time taken for total testing is shorter than taken by MRI. MRI cannot be done on patients who are claustrophobic as the patient has to remain inside the noisy machine for about 20-45 minutes. CT scan is cheaper than an MRI. A CT scan costs $1,200 to $3,200 while an MRI can cost up to $4,000. Not surprisingly, there are various CT scanners available and there is a large variation in price depending upon the features and brand. This is a good pricing guide for CT scan machines. A vanilla 4-slice CT scanner costs $85,000 to $150,000. A 16-slice scanner costs $145,000 to $225,000 and the top-of-the-line 64-slice CTs can cost up to $450,000. The machines may typically need annual maintenance, which can cost tens of thousands of dollars.